The Cisco Unified Computing System™ (Cisco UCS™) combines Cisco UCS C-Series Rack Servers and B-Series Blade Servers with networking and storage access in a single converged system that simplifies management and delivers greater cost efficiency and agility with increased visibility and control. The latest expansion of the Cisco UCS portfolio includes the new 1RU, Cisco UCS C22 M3 Rack Server and the 2RU, Cisco UCS C24 M3 Rack Server. These two new servers increase computing density and balanced price per performance, through more cores and cache balanced with ample memory capacity and disk drives. Together these server improvements and complementary Cisco UCS advancements deliver the best combination of features and cost efficiency required to support IT's diverse server needs. 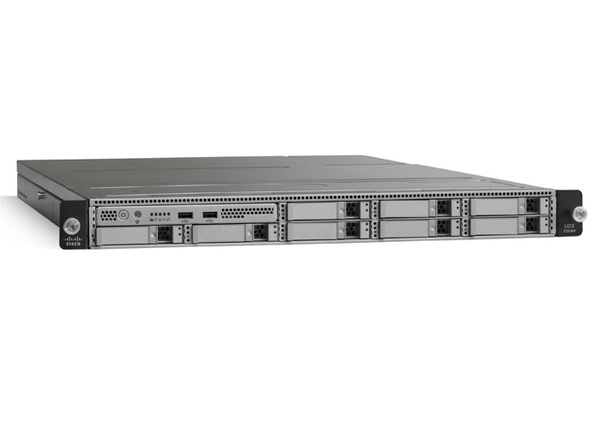 The Cisco UCS C22 M3 Rack Server (Figure 1) combines outstanding economics and a density-optimized feature set. The C22 M3 Rack Server targets entry level enterprise to SMB with applications such as scale out, virtualization, IT and web infrastructure, VPN servers, file/print servers and appliances. Building on the success of the Cisco UCS C-Series servers, the C22 M3 server and the Cisco UCS Virtual Interface Card 1225 (VIC) further extend the capabilities of the Cisco UCS portfolio in a 1RU form factor with the addition of the Intel® Xeon® processor E5-2400 product family, which delivers an optimal combination of performance and efficiency gains. In addition, the Cisco UCS C22 M3 2-socket server offers 12 DIMM slots, up to eight disk drives, 2 PCI Express (PCIe) Generation 3.0 slots, and two 1 Gigabit Ethernet LAN-on-motherboard (LOM) ports, providing both an excellent price-to-performance ratio and a compact form factor. The Cisco UCS C22 M3 server interfaces with Cisco UCS using another unique Cisco® innovation: the Cisco UCS Virtual Interface Card 1225 (VIC 1225). The Cisco UCS VIC 1225 is a virtualization-optimized Fibre Channel over Ethernet (FCoE) PCIe 2.0 x8 10-Gbps adapter designed for use with Cisco UCS C-Series servers. The VIC is a dual-port 10 Gigabit Ethernet PCIe adapter that can support up to 256 PCIe standards-compliant virtual interfaces, which can be dynamically configured so that both their interface type (network interface card [NIC] or host bus adapter [HBA]) and identity (MAC address and worldwide name [WWN]) are established using just-in-time provisioning. In addition, the Cisco UCS VIC 1225 can support network interface virtualization and Cisco Data Center Virtual Machine Fabric Extender (VM-FEX) technology.